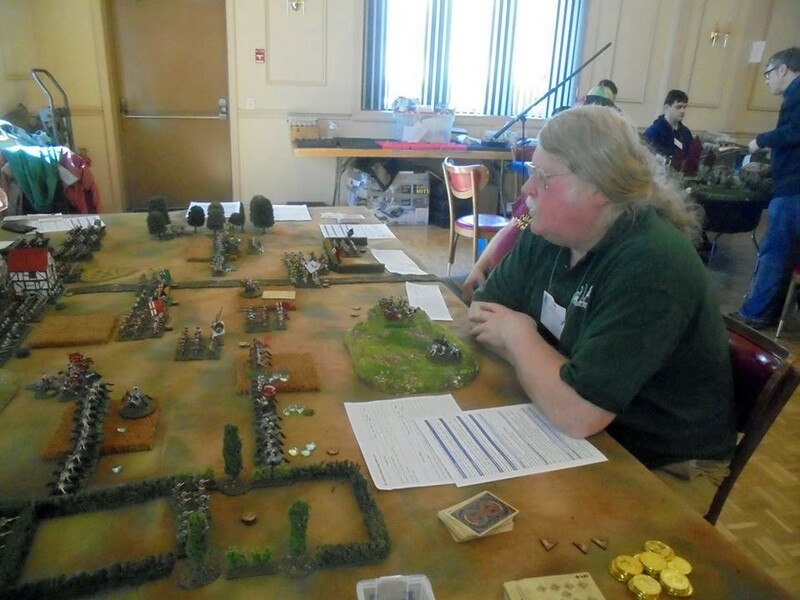 I ran my Soggy Bottom game at Battle Group Boston's annual HAVOC convention in Shrewsbury, MA, earlier this month. The game was played using Simon Miller and Andrew Brentnall's "For King and Parliament" rules, which are based upon the "To the Strongest" engine. Both games use a subtly gridded table, playing cards in place of dice, and relatively simple but effective rules. 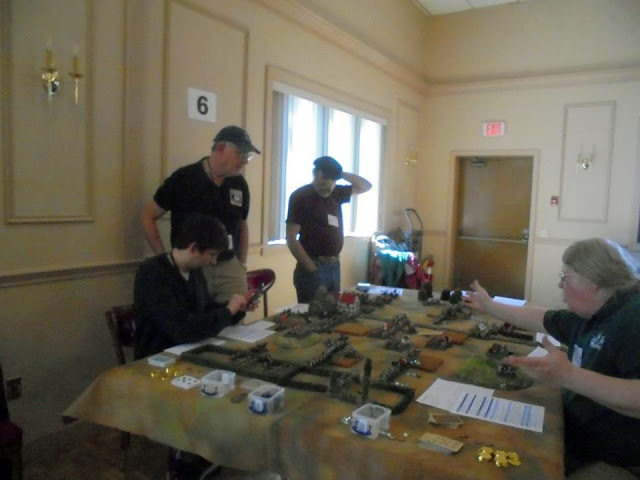 Mark took the Royalist left and Steve the right, while Ethan played the Parliamentary right and Rob their left. Mark is well known to me from his participation in multiple Snappy Nappy Campaign in a day events, and is a professional game designer (recent credits include "Hitler's Reich"). In other shameless plugs, I would point out that this years Snappy Nappy Campaign in a Day event is less than 2 weeks away. 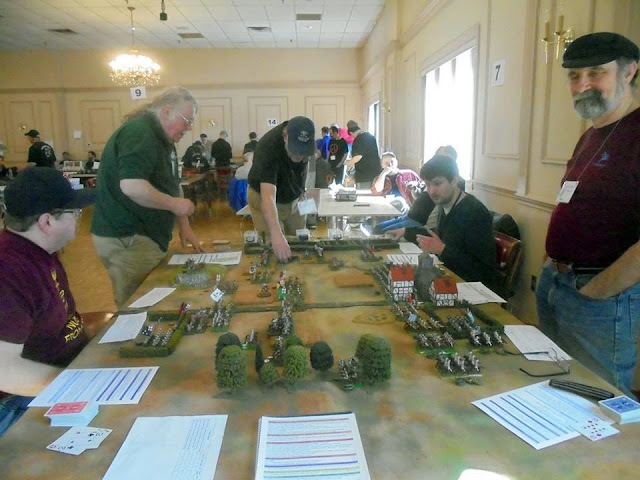 It will be GM'd by Russ Lockwood, and will be held at The Portal gaming space in Manchester, CT on Sunday, April 28th. It will be based upon the 1814 campaign, but assuming a more robust call to arms for "La Patrie en Danger! We still have some commands available, so if anyone reading this wants to play, email me (or leave a comment below) ASAP. The Royalists (top) advanced on Soggy bottom with alacrity... or at least some of them did! Sometimes an untimely Ace will dampen the ardor of event the most fervent Cavalier! Ethan (left) and Steve (right) opt for a relatively defensive stance, hoping to let their heavy siege guns make a contribution to their efforts. Ethan does advance his dragoons through the hedgerows, and Popham's veteran "Swedish Horse" are soon engaged with Lord Lucas' Royalist Horse. Popham's troopers had a slight edge in these melees. Rob's maneuvers are limited to shaking out his left flank cavalry into more effective positions, and advancing his commanded shot into the Bishop's Copse. Lord Lucas's Horse has ridden over Popham's boys, but must go into Pursuit as a result. Ethan studies the rules trying to figure out ways to dull the pain of losing his best cavalry right at the outset, while Rob remains stoic on the defense. The Royal artillery, sited atop King's Hill, looks for any targets that are not masked by his own troops. A nice view of midgame from the Parliamentary Right. Mark, who can be counted on to play aggressively, has pushed most of the King's infantry battalia to close range of the defending Roundheads. 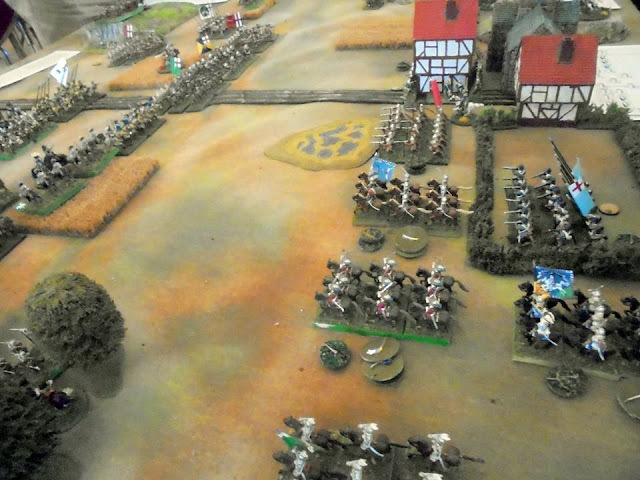 View from the Royalist right; the commanded Parliamentary shot in the Bishop's Copse are prompting prudence in the Cavalier advance on this flank. Mark has eliminated the last of the Roundhead Horse on his side of the field; Ethan forms Hedgehog with Essex's Orange Foote regiment, stationed atop Longbarrow Hill. 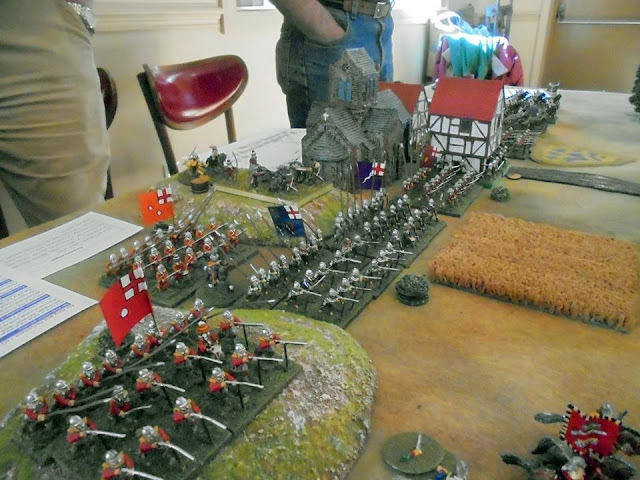 The veteran red coated king's Lifeguard of Foote has taken 2 hits from the Parliamentary guns, and has dropped back to Rally them of (they are the best infantry in the game). Overview of the Field from atop King's Hill. 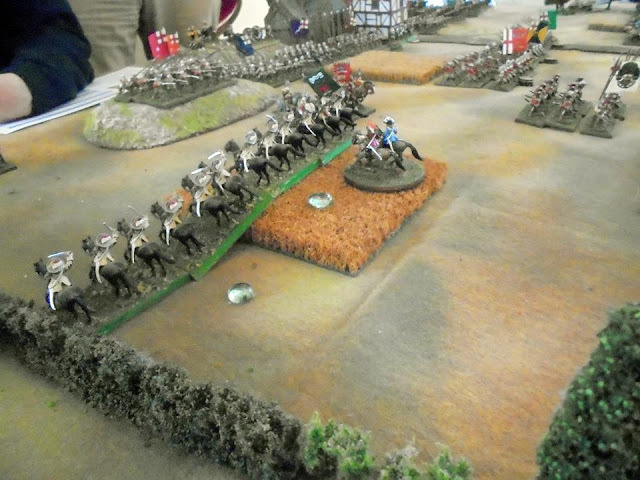 Unchecked when Ethan turns a very untimely Ace for his Infantry command, the Cavalier Horse destroy the Earl of Stamford's Bluecoat regiment in a flank charge (double hit cards played! ), and threaten to charge the Siege guns in the flank as well. 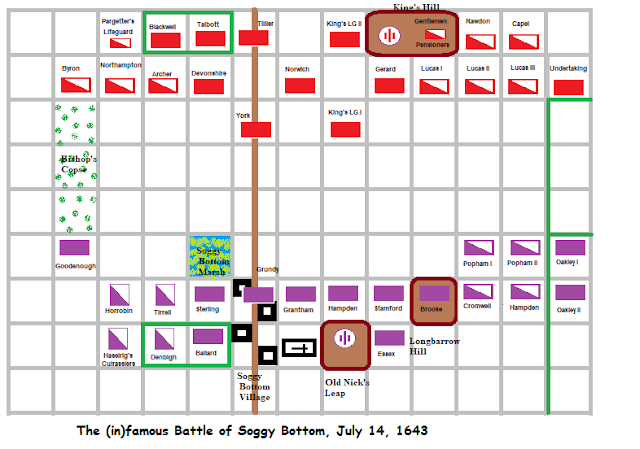 I*n the cat and mouse game between Mark's commanded shot (green coats), and Ethan's Dragoons, amongst the hedgerows honors are going to the king's men once again; just one more hit (dark scarab marker) and the second unit of Dragoons will be Lost as well as the first. Overview from the Royal Left; another Roundhead Foote regiment has been eliminated, this time one of Rob's in Soggy Bottom village itself. Rob didn't have good luck with his card play! Situation in the center, as viewed from the windows of Soggy Bottom Village. The Parliamentarians lost their last victory medal immediately thereafter; victory to the King... and Lord Pargetter! Well played all around, Gentlemen! As Mark commented, "It's Good to be King!". Surprisingly, not a single officer was lost in this game - a first for a TTS/FK&P game as far as I can recall! The Northern Horse (buffcoats) have just vanquished Popham's veteran Horse (which were yellow coats). 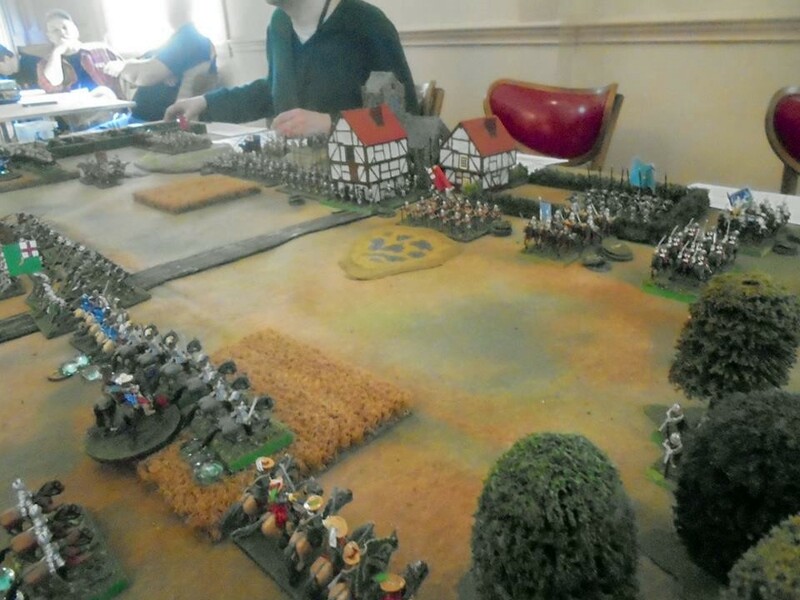 "Surely a finer sight was never seen, than the well ordered lines of Parlimentary Foote, as they awaited the onslaught of the enemy with cool steadfastness..."
Opposing forces approaching near the Bishop's Copse. Laying out the 8' grid on a new 9 foot by 6 foot cloth took me less than an hour; once the weather warms up I will apply the multiple passes of different colored spray paints to finish the cloth. similar to the one used in the game (which had a 6" grid, which is a bit small for the large ECW Foote units.